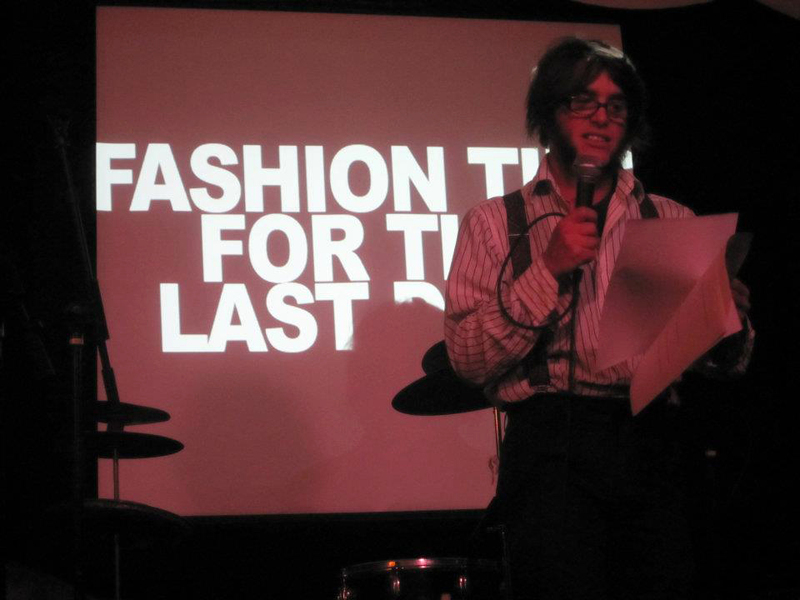 Last Wednesday it was the launch party for Fashion Tips for the Last Days. I’m delighted to say it went incredibly well – there was a good turn-out, I sold (or gave away) 40 copies of the book, and the performance was also successful – I gave a whistlestop tour through the last eight years of my poetry (which people seemed to enjoy!) ably assisted by my very special guests, Lou Ice (who also took the above photograph), Angry Sam and the Bobby Mc Gee’s. Thanks are also due to my fantastic saw playing duo, Kate Shields and Becca McGee, and my improptu swan-handler, Dr. Bongo.Thanks are also due to Alice and Dan Mounsey, who very kindly looked after the door for me during the first part of the show (especially as I’d kind of hijacked Dan’s 30th birthday to have my book launch – but he did get flowers, cava, cake and a creepy animated gif, and who wouldn’t want that!) and Andy and Adam for taking over the door on part 2. So far I’ve had two four-star reviews, from FringeGuru and Guide2Brighton, and loads of other great press, which I shall have to deal with in a subsequent blog post. I’m very much caught up in the mayhem that is Brighton Fringe, and so won’t get a chance to sort all this stuff out for at least another week or so. But, the book is officially launched. 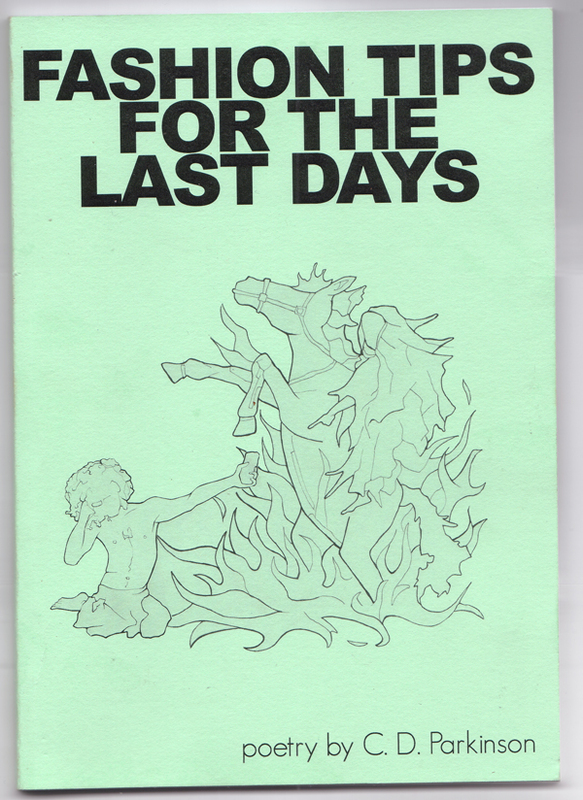 If for any reason you weren’t able to make it to the launch, then don’t despair – you can still lay your hands on a copy of Fashion Tips for the Last Days. The means by which to do this will no doubt increase – am going to be looking into some more sensible ways to sell the book online. In the meantime, here’s how to get a copy. a) Do you actually know me in real life and live in Brighton? If so, then probably the best thing to do is to stop me and buy one. I’m trying to bring a few copies around with me wherever I go at the moment, and they’re only £4, which is cheaper than a pint of beer in many Brighton establishments. b) Do you either not know me or don’t live in Brighton? In this case, the best thing to do is write me an email. I’ll then let you know how you can slip a cheque or some well concealed cash in an envelope and send it to me in exchange for one of these delightful books. It’s a fiver including postage, which lends itself to the well concealed cash approach. Alternatively, I’m hosting the Brighton Fringe poetry slam at the Hendrick’s Gin Library on Monday 21 May, and am the guest Brighton poet at Hammer & Tongue at the Komedia on Thursday 7 June, so you can always get a copy off me then. I’ve probably got loads more to say, but I’m going to end here, and shall carry on writing about all the exciting things that have been going on this month at a later date.